Redland City SES crews are paying it forward in Townsville, working alongside locals and state agencies to help that community deal with unprecedented flooding. Redland City Mayor Karen Williams said four Redlands SES volunteers arrived on Saturday with seven more due for deployment on Wednesday. “Our orange angels never fail to step up when people – both on Redlands Coast and further afield – are in need of help,” Cr Williams said. “North Stradbroke Island’s November 2018 fire saw Redlands SES members working hard to move fire fighters around the island, keep them fed and staff road and track closures. “Jumping from fire to flood, they are now helping tarp Townsville homes, perform emergency roof repairs and clear fallen trees and debris. 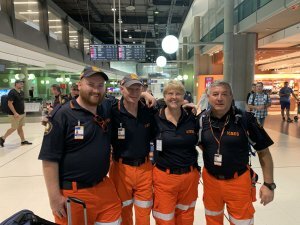 “With many Townsville residents still sheltering in evacuation centres, the seven extra Redlands Coast volunteers heading north will be welcome. “This team includes experienced hands as well as newly qualified operators, who will learn a great deal working under these emergency conditions. 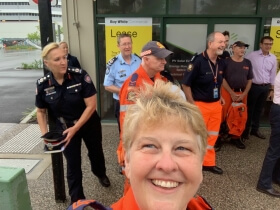 Redlands SES volunteers head out from their hotel with QFES Commissioner Katarina Carroll and Queensland State Disaster Coordinator and Deputy Commissioner of Police Bob Gee. “Also heading to Townsville are Redlands Deputy Local Disaster Coordinator Mike Tait and three of our Southern Moreton Bay Island Community Champions, the latter deployed by the Australian Red Cross to help set up more evacuation centres. “On their first deployment outside Redlands Coast, our Community Champions will use their experience of evacuation centers gained during Russell Island and North Stradbroke Island fires. “This is yet another sign of how successful Council’s Community Champions program has been.